Spicy nut and seed bars, featuring almonds, pepitas, hemp seeds and flax meal with spicy jalapeno powder and sweet maple syrup for a delicious, healthy snack! 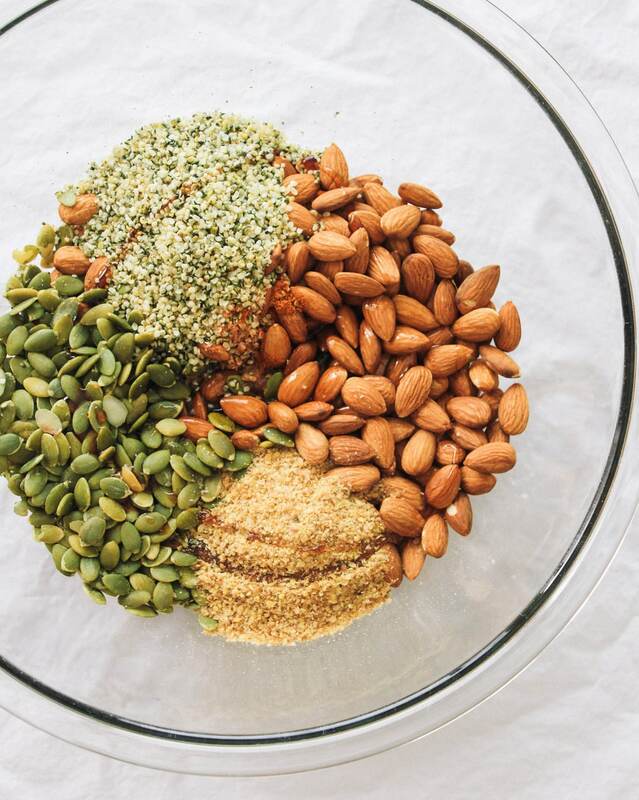 This nut & seed bar was inspired by the ‘Roasted Jalapeno Almond Protein Bar’ by Kind. After sourcing out a jalapeno chili powder and a few trial and errors, I’ve come up with a pretty darn good replacement. The ingredients in their bar uses honey, but I’ve omitted and used pure maple syrup in its place making this a vegan version. In my trials and errors, I used both cayenne and jalapeno chili powder. I love the jalapeno powder but the cayenne is pretty good too, if you cant’ find the jalapeno powder. The flavors mingle between slightly sweet, spicy heat and salty. It bakes up with just the right amount of crispness making for an irresistible anytime snack! This homemade nut & seed bar recipe is full of protein, fiber and the all essential omega’s to help fuel your day and keep you feeling great! 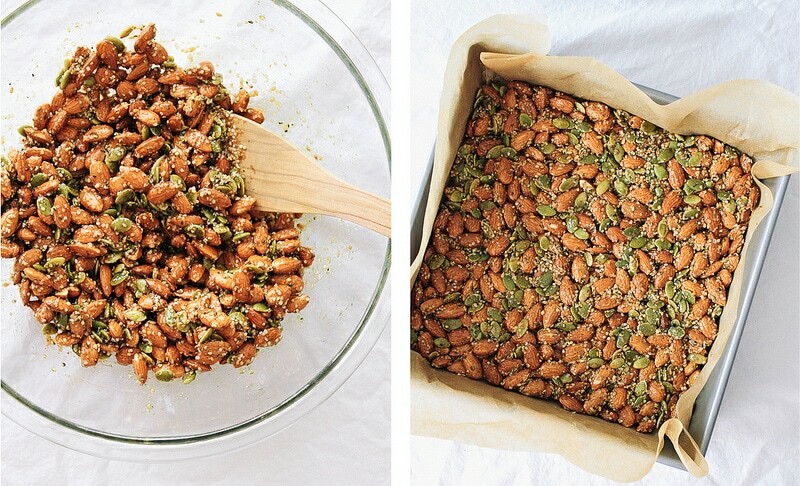 You’re going to love how easy these protein rich nut and seed bars are to make! You’re going to love how simple these are to make. Easy as 1 – 2 – 3! Start by adding the ingredients to a large bowl and mix well. Place wet mixture into a baking pan lined with parchment paper. Firmly flatten the mixture evenly across the bottom. Bake, let cool and slice. That’s is Spicy Nut & Seed Bars made easy and healthy. Enjoy the simplicity and share the love! Spiced with jalapeño chili powder, these nut & seed bars make for a perfect savory snack any time of day! Line a 9×9 baking pan with parchment paper. In a large mixing bowl, combine all the ingredients starting with nuts & seeds, spices and lastly maple syrup. Mix well to coat. Fill lined baking pan with wet mixture and flatten, pressing firmly, making sure to reach all edges and corners as best you can. Place in oven on middle rack and bake for 25 – 30 minutes. Once done, let cool to harden. Once cooled it will be a solid piece. Slice in half, then cut each half into 1 – 1 1/2 inch bars. Store loosely covered and enjoy often! If you don’t have hemp seeds, use any color sesame seeds you like.